Pike bases her engrossing debut on recent research into the Arthurian legends’ possible Scottish origins. Fiery-haired, strong-willed Languoreth, daughter of King Morken of Goddeu, adores the wild places and pagan rituals at her home at Cadzow Fortress in Strathclyde. However, she resents that her destiny lies in an advantageous marriage rather than training to become a Wisdom Keeper (druid) like her twin brother, Lailoken. Her story, beginning at age 10, has a slow but compelling build. As she grows into adolescence, danger threatens her livelihood from different sides: the invading Anglo-Saxons are attacking villages, while Christianity’s influence is increasing. Although reluctantly agreeing to wed Rhydderch, the tyrannical High King’s son, Languoreth’s heart remains with the warrior Maelgwn. Pike’s narrative blends court intrigue, romantic interludes, and gritty violence into a literary brew worth savoring to the dramatic finale. The elements of Celtic mysticism will appeal to fantasy fans looking for a Mists of Avalon–type experience, while the setting remains grounded in sixth-century Scotland’s political realities. Enthusiastically recommended for readers of female-centered historical sagas and those enamored of Arthurian tales. 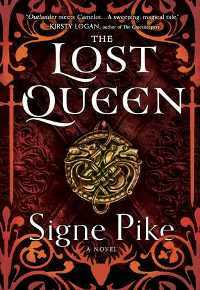 The Lost Queen, first in a trilogy, was published by Touchstone/Simon & Schuster this week. I read it in June, and the review appeared in August's issue of Booklist. That's a good question since I don't know anyone personally with that name, but it seems to be pronounced Sig-nee (more typical in the US) or Sig-neh. I wondered about that too! Hope you enjoy also, if you get a chance to read it!